Once the weather warms up most people start planning their summer days at the local pool. But aside from a new suit and some sun protection, many don't give a thought to pre-swim precautions. Perhaps the biggest precaution you should take is with your hair. Swimming pools must maintain high levels of certain chemicals, especially chlorine, in order to keep the water virus and bacteria free. Unfortunately, these same high levels of chlorine that keep your body safe can play havoc with your hair. The oxidising agents in chlorine cause it to strip your hair of moisture, leaving it Dry, Brittle, And Prone To Breakage and split ends. Another cause of hair damage from swimming pools is high levels of copper and unbalanced pH levels. High pH levels can react with copper found in pool water and cause hair to turn green. The green tint comes from the oxidisation of the metal that has bonded to the hair shaft. Since dry hair acts like a sponge the minute it comes in contact with moisture, the best way to protect your hair before swimming is to wet it thoroughly with non-chlorinated water. This way your hair will absorb the "safe" water and, once you get in the pool, your hair will be too saturated with clean water to absorb much chlorine. It is also a good idea to exit the pool every 30 minutes or so and rinse your hair with clean, non-chlorinated water. This helps keep the saturation of chlorine to a minimum, especially if you plan on swimming for long periods at a time. Another way to protect your hair from absorbing too much chlorine is to coat it with a thin layer of conditioner or oil before going for a swim. Simply comb your favourite conditioner or a small amount of baby oil, coconut oil, or olive oil through your hair before swimming. The oil will repel the water and seal the cuticle of the hair shaft acting as a barrier between the chlorinated water and your hair. 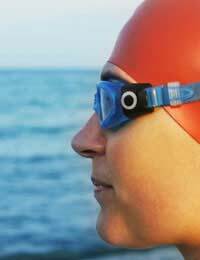 Perhaps the most effective and easiest option for hair protection is to don a swimming cap. The rubber-like cap will keep your hair safe from the chemicals in the water and keep your hair dry do you are ready to go immediately after your swim. No blow-drying, styling, or fuss necessary. Finally, you can further protect your hair from the damaging effects of swimming pools by washing it after every swim. Immediately after swimming rinse your hair with warm, non-chlorinated water for three to five minutes. Next, wash it thoroughly with a clarifying shampoo. Towel your hair until it is just damp and then use a wide-toothed comb to distribute a leave-in conditioner throughout your hair. By taking a few minutes before and after each swim to protect your hair you can enjoy your swimming pool time and luxurious locks all summer long! Find out how can you tell if pollutants are affecting your hair, and what can you do to prevent it, in our feature Pollution And Hair Loss.